That McKinnon will be an accessible centre with a strong village feel, which recognises and celebrates its heritage, art and local history. 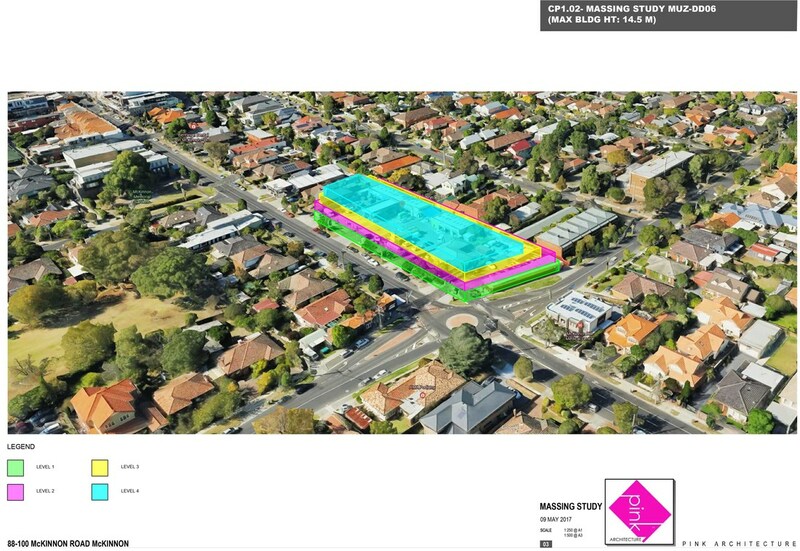 Jacqui Brasher stated in her submission to the Planning Panel (Page 6) Given the amendment site is located at the very edge of a neighbourhood centre, policy encourages a town house style development as opposed to apartment style development. Mitigation of storm water flooding (the site is subject to a SBO). Again, we draw your attention to the lack of real consultation with the community regarding the proposal of a GRZ2 zoning. Ms Brasher admitted that the MUZ1 / DDO6 was exhibited to “test the waters” (Council’s words). Only Eight objections were received! That's right. Eight. In attendance were two councillors, two developers and one resident (Bette). This is EXTREMELY disappointing - residents need to be aware that making a post on the Glen Eira Residents' Action Group Facebook page does not equal job done. The conference lasted all of 30 minutes. A Council decision is scheduled for 25 July meeting. It was chaired by Jim Magee and aided by Madeleine Snell. Developer representative was Urbis. (This is the same company representing the developers for 88-100 McKinnon Road rezone application). Council, rather than summarising GERA's comment re a 3 storey interim height control on Centre Road major activity centre vs. a proposed 6 storey in McKinnon Road (a lesser activity centre) as "excessive height", should give it the emphasis it deserved in the forthcoming officers report. Developers commented that a car parking waiver was sought (2 spaces) and was supported by development's removal of 5 currently existing crossovers was apples and oranges. The additional onstreet parking provided was time restricted - it did not equate to providing non time restricted on site visitor parking. Lane way access was not supported by Council policy and failed to account to current laneway by existing businesses and likely future development. The developer's representative noted that as they are the first development in that area, they therefore, don't need to consider the cumulative impact of the development. kindly reproduced from the Glen Eira Residents' Association website. The following is an email sent to us from William Pierce from Urbis Planning, who are now representing the developers in the C143, 88-100 McKinnon Road development. Email starts below. Please see attached and below (as requested by the Panel) setback diagrams and high level traffic analysis which considers both the GRZ2 and the abandoned MUZ/DDO. This information illustrates the maximum development potential of the site considering the various requirements with respect to height, setbacks and, in the case of the GRZ2, 35% garden area. The reality however is that the development potential of the site will likely be less than the estimates contained in this analysis considering that it is unlikely that future development will occur in a single stage. Furthermore, there are other planning requirements with respect to internal amenity and off site amenity (shadowing etc.) that may also reduce development potential beyond that shown in this high level analysis. - Height - 10.5 metre maximum building height (3 storeys). - Setbacks - Garden area requirements will likely warrant up to 7 metre setbacks to rear boundary for landscaping and open space however this could be as little as 4 metres to the ground level and 5.5 metres at first floor. Front setbacks are 3 metres to allow for some private open space and landscaping. 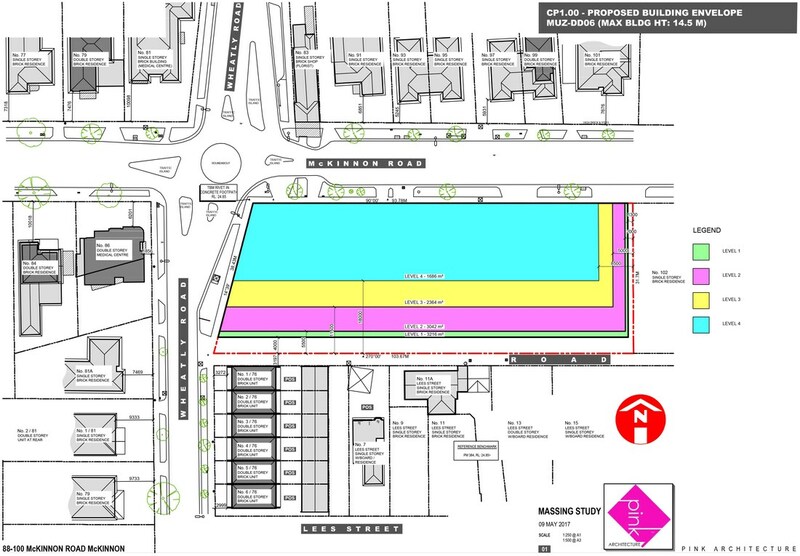 - Yield estimates - Based on a conventional apartment format of development up to 85 dwellings is achievable generating a requirement for 130 car parking spaces. - Traffic analysis - Adopting a conservative trip generation rate of 0.5 movements per dwelling (in consultation with engineers at the City of Glen Eira), it is estimated that there will be up to 43 vehicle movements. Please feel free to contact me if there are any questions whatsoever. Take a look at the proposed car parking and the number of proposed three-bedroom apartments. Below are proposals for MUZ, which will be on the table at the Planning Panel. The development is surrounded by mostly single storey dwellings. We refer to our emails dated 19th March (prior to the Council meeting on 21st March) in which we requested that you “vote to abandon this amendment in its entirety and request that residents be consulted on the proposed re-zoning BEFORE any new amendment for this location is submitted to the Minister for exhibition”. Can you please advise if you aware that this is the case, and if so can you please explain to us why this has happened – and more to the point why were objectors advised that the Council resolution "abandons" the Mixed Use Zone and Design and Development Overlay when in fact Council had merely changed its position and added GRZ to the Panel's review. Thank you for your email on Tuesday 25 April, regarding the McKinnon Road Planning Scheme Amendment, my apologies for the delay in responding, I wanted to make sure I had a clear understanding of our position. As you know, Planning Panels Victoria are an advisory body and not a decision making authority, as such they make recommendations to the Responsible Authority, in this case Council. As part of their assessment of the amendment they are required to turn their minds to the amendment process, the exhibited documents, the Council resolution and most importantly the submissions received. They are not able to reinstate the Mixed Use Zone and Design and Development Overlay to the amendment process, however they are entitled to consider its merits and if choose to, they are able to recommend that the Council reconsider the MUZ and DDO. However, as previously stated the Panel is only a recommending body, Council is the Responsible Authority which has recently resolved to abandon the MUZ and DDO, following community consultation. Once Council receives the Planning Panel’s recommendation, the Council will decide whether to adopt, modify or abandon the amendment in its entirety. If Council decide to adopt the amendment, it is then referred to the Planning Minister for final consideration and approval. I should note that the Planning Minister also has the right to approve, modify or abandon the amendment at the final stage. I am advised that at the Directions Hearing, Council Officers were questioned as to why Council exhibited the MUZ when the GRZ2 was available from the beginning of the process. In responding to this question, Council’s representative simply stated the facts that Council resolved/supported to exhibit the MUZ to seek community consultation. As Mayor, I can say that after considering the community's submissions, the Council resolved that MUZ is not the right zone for this site. As such, Council has referred the GRZ2, which is a less intensive zone, to the Panel. If you have any further queries please feel free to contact me or go directly to Aidan Mullen, Manager City Futures on 9581 4538. As we previously advised there is an Independent Panel hearing relating to this amendment on 25th May. At the recent Panel Direction Hearing we became aware that the Independent Panel is legally required to provide a recommendation on MUZ & DDO (as this is the exhibited amendment), as well as GRZ2 - so will therefore be reviewing both options. We have contacted all council members (via email on 25 April), and are awaiting clarification from the 8 councillors who voted on the night to refer the matter to an Independent Panel. Those who submitted objections will by now have received a letter from Planning Panels Victoria in regard to the hearing dates. Stage 1 will be the Directions Hearing. This is the big one. This is your opportunity to voice your objections, again, and bring in experts. It will take place over three days. You must RSVP to attend. The deadline is 12 noon, Tuesday 18 April 2017. You must fill in the Request to be Heard Form. You can do this online. Click here to fill it in. Again, numbers count in this process so please, if you can, fill in the form and attend the Public Hearing in May. A number of people mentioned that given these numbers was not sure why the conference was required as the number of objections indicate public feeling about the amendment. Residents at the meeting respected the applicants right to seek re-zone of their property but that the incorrect rezoning/redevelopment was being sought. There was concern and frustration about the lack of transparency relating to this proposal and general disbelief when the applicant mentioned toward the end of the meeting that a sight line/building envelope plan existed but had not been made available and were not made available during the conference. Jacqui Brasher, Principle Strategic Planner, advised it would be made available on the website, the day after the conference. Note: plans were made available on the website the following day, but does not include any information about property on the Eastern Boundary directly abutting site which will be significantly impacted by any development on the site. Aimee Dash stated that the building would only have 60% site coverage, however the site line/building envelope plans provided the day after the conference suggests boundary to boundary coverage. Even the 3rd floor (top) storey appears from a visual inspection to cover at least 80% of the site. She was also unclear about set-backs on the property – first stating that the front boundary would be in line with existing houses in the surrounding area, and then later stated that the front boundary would be at footpath. General sadness about how this will impact the Village feel, which is the reason people chose to live here. Fear that if this is approved it will just allow high density development to “spread like a cancer” and before long, McKinnon will be devoured by developers with wall-to-wall high density apartments. 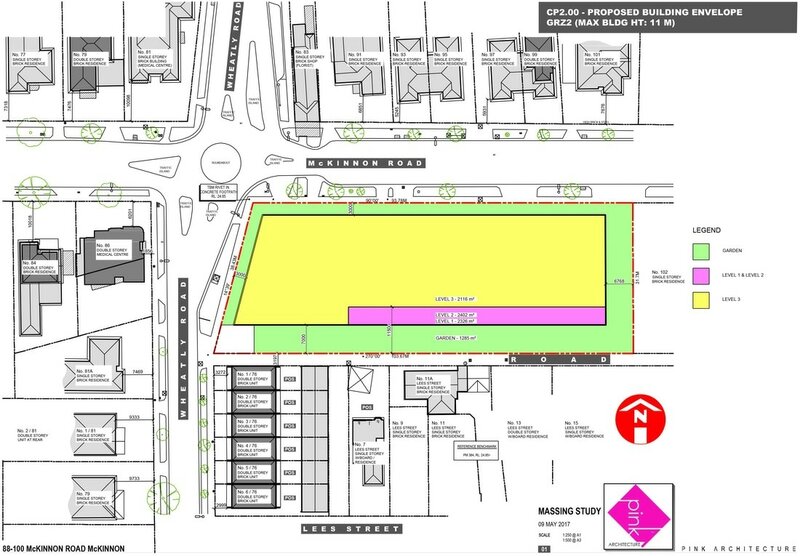 A number of objectors stated on the night and via their written objections that a more appropriate height limit for this site would be double storey town houses, given the predominant building height currently in the area is one/two storey buildings. Concerns about privacy & overlooking, and impact on sunlight in neighbouring properties. Properties abutting the development have a right to privacy, a right to quiet enjoyment and a right to sunlight. This development will take that away. The concept of a gateway building was discussed. One objector suggested that McKinnon currently has a Gateway Building, the McKinnon Hotel, which has been recently renovated. Also the site at the corner of McKinnon & Jasper roads, which is currently in the process of redevelopment, are gateway buildings. If a “Mixed Use” development is required, the commercial area of the village would be a more appropriate location. There is no requirement for a “Gateway” building at this end of McKinnon Road as it is a residential area. Concerns about impact on drainage & sewage systems and flooding were brought up. This was a big concern for a number of residents, and some gave examples of recent flooding. There is a belief that any basement car parking in a flood plain area will impact the surrounding homes. We are sitting on a flood plain and residents voiced concerns about previous floods and the inadequacy of the drainage, which has come up numerous times at council meetings over the years and has yet to be fixed. There were concerns about impact on traffic & parking. A number of objectors pointed out how difficult it is to currently navigate the roundabout at Wheatley Road without the impact of a major high density development. Also concern about the proposed entry point to a development which would be via a narrow rear lane 3.5m wide – barely wide enough for a single car width, and currently a blind entrance, and also located near the Roundabout. Also of note: no clarification was provided on exactly what the new tender advertised by the council entails for this roundabout. One objector who takes their children to Ormond Primary school stated that they avoid the Wheatley Road McKinnon Road roundabout at the moment as it is already dangerous and she has witnessed many near-miss accidents. One resident who lives near Ormond Primary noted that during school hours he couldn’t get his car out of the driveway. An increase in school population due to increases in population of the suburb will have a detrimental affect on residents surrounding the school. Ann brought up that only recently, the large service station had a ‘petrol sale’ on a Sunday. The traffic chaos that ensued was dangerous. The traffic was piled up all the way down McKinnon road. Many impatient drivers overtook the waiting cars to avoid waiting for traffic to move. The neighbour witnessed a car accident. And this was just for a few hours. Does McKinnon need more shops? Given that many of the shops in the Village (in the commercial zone) appear to be vacant and already suffers from lack of parking will only make it more difficult. Concern that this is just ploy to introduce a 4 level development, which will then become totally residential. This question was put to Jacqui Brasher, who on pressing, responded that “potentially this could happen” due to the economic viability of the current shops in the area. Concern was raised about gardening and landscaping around the building. A current development on the corner of Bent Street and McKinnon Road had overgrown grass and nature strips for months, creating an ugly view from the street. A three or even four storey building will dominate the landscape, its visual bulk will be seen from the top of McKinnon Hill. Concerns about scale-down, that is, the surrounding properties are predominantly one-storey homes. The issue of waste disposal was brought up. Potentially 50 apartments on that block. How will that affect the surrounding area in terms of elimination of waste and waste pickup? Putting this proposal through will create a precedence for other money-grabbing developers to impose new heights in the area. What is to stop them building four storeys in other non-gateway residential areas? Many buy into the McKinnon Secondary School Zone (which this development is part of) in order to send their children to McKinnon Secondary College. It is already at capacity. It has already been stated by the principal of this college that developments are increasing enrolments and they are already at capacity. This will burden the high school and as a result, will affect their standards of education. McKinnon road is not a major retail strip. Nor is it a major road compared to Centre Road or North Road. Parking is already at capacity. Traffic is already at capacity. The area is surrounded by GRZ and NRZ. It’s a residential zone. Properties abutting development will be immediately affected with a decrease in property values. Combined with the affect a four storey development will have on their right to privacy, sunlight and quiet enjoyment on the surrounding residents’ properties, residents will have no choice but to sell up to developers. Which is great for developers who then leave the suburb with their millions lining their pockets but what will happen to residents left to live amongst unsustainable density? The look and feel of the neighbourhood is already changing. Residents moved here because of the character of the neighbourhood and the pride residents take in their properties of character – Californian Bungalows, Art Decos, vintage cottages. A development like this will start a precedent for further developing and subsequently ripping the heart and character out of the suburb. In line with other developments happening in the area, restrictions to parking permits and visitor parking have been granted by council in the past. The cumulative affect will be that the traffic will become gridlocked. It was brought up that an increase in population will increase crime rate in the area, as properties are being snapped up as investments and rented out. With an increase in transient populations, studies have found a link to an increase in crime as temporary residents don’t have an investment in the community compared to home owners. With the scale of developments already happening in a small area, streets and footpaths are blocked off by developers. Trucks crowd small streets. Increasing densities also create a lack of parking with high number of vehicles parked out on the street. This combined creates traffic chaos as well as danger to pedestrians. Opposite McKinnon Village I found this sign for this proposed development, which has been in planning mode for some time, ever since these three properties sold together some years ago. Twenty-one flats is what is being proposed here. Can you imagine the traffic chaos, especially being close to shops and the train station? Last Sunday, the large petrol station at 100 McKinnon Road decided to have a massive fuel sale. They were selling petrol at 84c per litre. The resulting traffic chaos that eschewed cannot be underestimated. I posted a video of it on the McKinnonregrets instagram feed. I even witnessed a car accident because of frustrated drivers who were trying to avoid the traffic standstill. This lasted most of Sunday on McKinnon road, a day which is normally quiet. I didn't dare drive out of my own driveway. So, imagine what McKinnon Road will be like as more apartments are packed into these small blocks? You will see that the developers are applying for a reduction in the statutory car parking requirement. Reducing car parking requirements is fine if there was a cultural shift in how Melbourne residents travel. But that hasn't happened yet. According to an ABC article from 2014, two out of three Australians drive to work and only one in ten rely on public transport. Those figures would not have changed much since 2014. And as teh construction begins on the corner of Bent Street and McKinnon Road traffic chaos and congestion is only going to get worse. And forget about trying to find a parking spot around this area. All you have to do is take a look at Bent Street and the parking mess there. Let's also take a look at the motor vehicle statistics here, conducted by the ABS on 31 January 2016. As a member of the Glen Eira Residents Action Group on Facebook pointed out, there are 18 million vehicles in a population of 24 million. That is, 3 vehicles for every 4 Australians. When you take out the too young and too old from the equation you are left with a question of, how many people who live in a 2-bedroom apartment have a vehicle? If we factor around 1.5 vehicles for a 2-bedroom home, then it raises the question of how many vehicles will spill out onto the street? 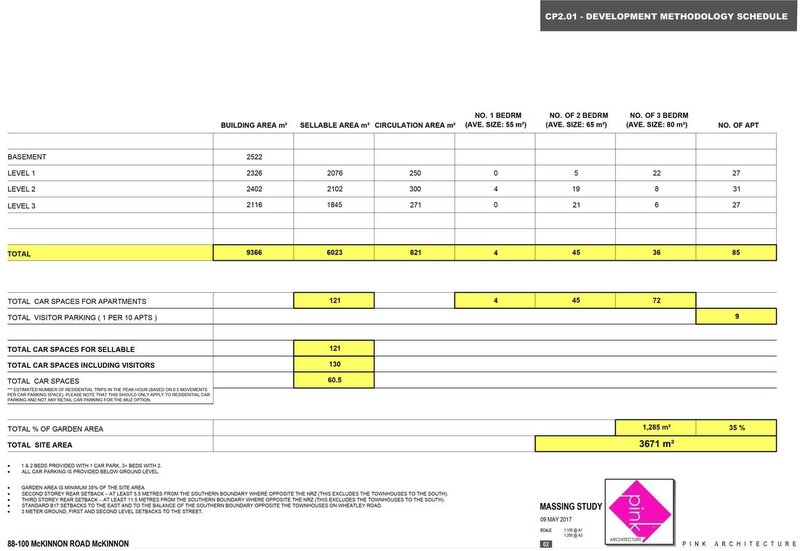 From the plans, which you can download below, there are 3-bedroom apartments included in this planning permit. And with the developers requesting reduced parking as part of their submission, my guess is there will be a number of cars spilling out onto the street. 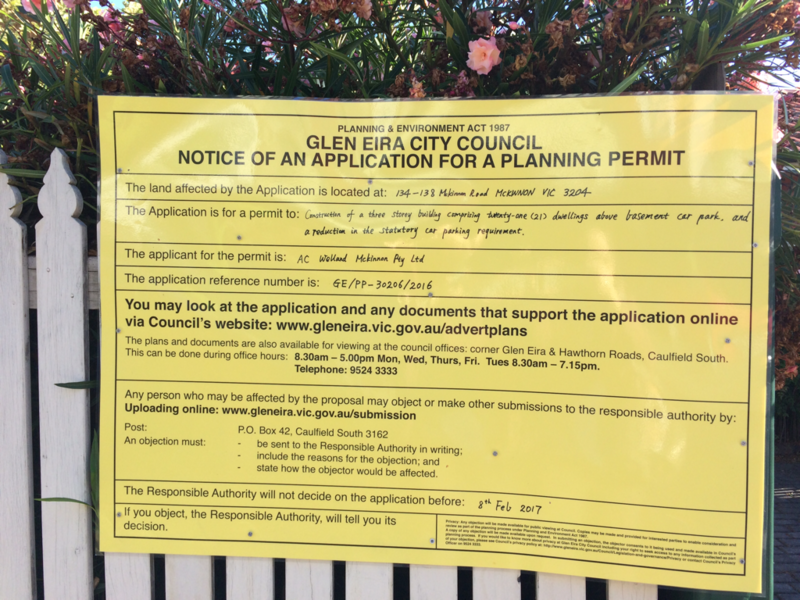 Buried in the Glen Eira Council website are the plans for this. We are concerned residents who live on McKinnon Road, near McKinnon Village. This website was set up to object to the C143 ammendment to 88-100 McKinnon Road, McKinnon. If this, and the DDO overlay for four storeys goes ahead, it will be a catastrophe.